Announcing the Launch of Name Game Today! 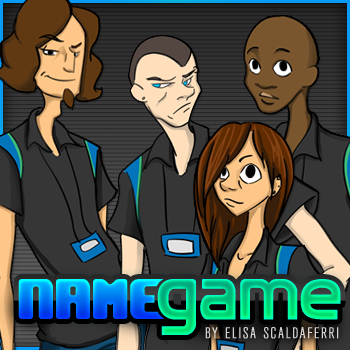 You loved it, and we listened: Name Game will begins its run as a feature comic today! We're proud to announce the launch of Name Game as its own feature comic, right here on The Escapist. Starting today, you can get a weekly fix of Elisa "LeeLee" Scaldaferri's hysterical retail insights. Name Game began its run at The Escapist back in May as part of the Sunday Funnies. Not surprisingly, it was incredibly popular--so popular that we knew we couldn't just run it every other weekend. With that in mind, please help us welcome Name Game to The Escapist's Web Comics array! Catch Name Game every Thursday, and don't forget to check out Stolen Pixels and Critical Miss on Tuesdays and Fridays.